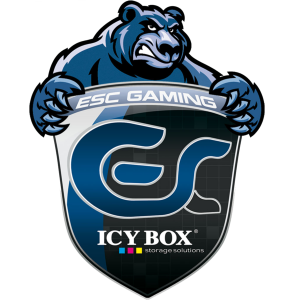 ESC Gaming went into Group C looking as though they were probably the favorites to win the group - but they ran into some heavy and unexpected resistance from Nuit Blanche and Missing In Action to be denied the top spot in the group. Having to settle for second place they find themselves in the upper half of the bracket where they will play ReG Gaming, the underdogs, before meeting Cascade in the RO8 if they win. It’s not as tough a road as the lower half of the bracket, but Cascade have proven to be one of the powerhouse teams in the groups and ESC are going to have to bring their absolute best if they want to move on past them. Their line-up is definitely one which will allow them to do this. A mixture of players performing well in major tournaments backed up by a decent line up of Grand Masters and an Academy team with a scary number of strong Protoss players seems to be a relatively standard composition for teams who have done well so far in the SC2ITL. Arthur, Showtime and Goody will be leading the way forward and all of them have the potential to take down the best of the best. Goody, playing his standard Mech style will be able to force opponents into positions they aren’t comfortable in - and in BO1 situations this can be a very powerful ability to have as something as small as this is all it would take to quickly see ESC into an advantage in any all-kill match. Arthur and Showtime are both WCS Premier League players in 2014, although ShoWTimE has already fallen in the RO32. Arthur will go into action in the coming days and being the newest recruit to ESC he could be the ace player who will really pack a punch against any walls in the way of ESCs trip to the finals. Being one of the fan favorites can definitely be tough, but if anyone is going to deal with that pressure and be one of our finalists then ESC definitely have the experience and depth to be it. We managed to get Stephan ‘BlAckSuN’ Pierenkemper - one of the ESC Managers - to answer a quick few questions to get their opinions going into the final stages of the SC2ITL Season One. Wardi : You guys were one of the fan favorites going into the SC2ITL to make it far. Going into the group did you expect any trouble? BlAckSuN : We expected to get out of group stage in quite an easy way. In the beginning we lost some points cause of unexpected good opponents. Sadly we didn't place 1st but in the end our results are quite ok. nB) played very well till now so they deserve the #1. Wardi : In the playoffs you come up against ReG Gaming first, the underdogs of the whole playoffs. Any worries about their Protoss-heavy line-up? BlAckSuN : Our chance of advancing in the first round of the playoffs are quite high. Nevertheless ReG did make it out of group stage too, so we do not underestimate them. A heavy Toss lineup is always hard to beat and we have to play the best to advance. Wardi : If you make it past ReG Gaming you play either mYinsanity or Cascade, depending on the KRN vs mYi result. These two teams have been untouchable so far - could you stop them? BlAckSuN : mYi is the overall favorite in the League in my opinion. If we have to face them it will be really hard to win, but its not impossible. Against Cascade I feel a much better chance to win, but they could beat us in the ESL League qualis last time so it's a 50/50 chance to advance. Wardi : Your team is one which hosts an academy which has multiple aspiring players. What do you feel the importance of an academy is to a team such as ESC? BlAckSuN : We don't want to have a team which just consits of 2-3 'pro' players so we descided to pick up some really good upcoming players to strengthen our roster. Its always good to have a good amount of nice and friendly persons around you to communicate with and to discuss strategies or just watch some games. We really feel that the mix is important and we are really happy that we found some good fellows. Wardi : Any final words, shoutouts or sponsors you wish to mention? Thanks to our main Sponsor ICY-BOX and Sennheiser as well as Ultraforce and Eizo to provide us with a good equipment and some money so we could perform as good as possible. Thanks to ESC for taking the time to answer the questions. They seem fairly confident going into the playoffs - especially now they know they will play against Cascade in the RO8 should they make it this far. This can only be a good sign for any ESC fans who will be cheering them on in the final stages.